Streamline trial execution and ultimately improve patient outcomes. With real-time access to clinical data, you can make better quality decisions and speed time to market. Who should watch the EDC webinar? If you are involved in data management, clinical development, clinical operations, biometrics, data science, or IT then this webinar is for you. Configurable collaboration environment with built-in review and approval workflows that includes a visual drag-and-drop CRF and edit check user interface. 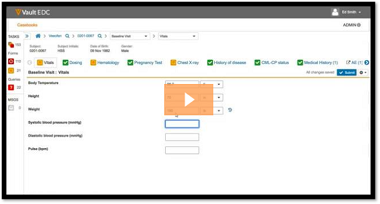 Empower sites to customize their casebooks to suit patient workflows. Leverage the most advanced sites by sharing study- specific source designs to optimize data collection. Drastically reduce site paper transcription, queries, and monitoring/SDV. Personalized user dashboards and workflows provide immediate direction of users’ tasks and eliminate time spent searching for information or reporting. Build once for EDC and eSource, improving site protocol compliance and entering cleaner data immediately. Ensure all studies can be conducted in compliance with local and international regulatory requirements. Rank data based on its importance (primary endpoint vs. non-core data) to prioritize collection, review, and cleaning. Improve site monitoring and data management planning with a shared data model, enabling risk-based approaches. Amend study designs at any stage without downtime or migrations. Publish only new changes with complete control over deployment across users, sites, and regions.